Today I found out how the French flag came to be as it is today. As with several other countries, the original flag of France was that of a saint—in this case, the oriflamme, the flag of St. Denis. The original banner had three to five pointed ends, more like our idea of a pennant than a flag, and was likely made of red silk without any decoration. It later morphed into oriflammes that had yellow stars or sunbursts with a red background, which was symbolic of the blood of the beheaded St. Denis. Charlemagne supposedly carried it to the Holy Land and the flag was considered his personal banner, but most likely the flag’s first use as a symbol of the royal house was in the reign of Louis VI, around 1124. In 1328, the House of Valois rose unexpectedly to the throne after the Capetian line died out—Philip IV’s three sons all died leaving only female heirs behind, who could not inherit the throne. The House of Valois’ coat of arms consisted of three fleurs-de-lis on a blue field bordered in red. The coat of arms was the basis for a new French flag. 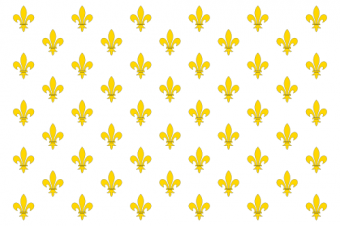 When the Bourbons took over the crown, the background of the flag changed to white in honour of their family colours, but the fleurs-de-lis remained. The current French flag is called the tricolore. It consists of three equal vertical stripes of blue, white, and red. It was initially established as the flag of France after the French Revolution of 1789. The revolution called for liberty and equality, and the simple flag went against the traditional, more extravagant flags used by members of the nobility. There are several theories regarding the symbolism and position of the colours of the French Flag. The colours are believed to have been inspired by a rosette that appeared during the revolution. Red and blue were the colours of Paris and appeared on the Parisian coat of arms—blue was associated with Saint Martin, while red was associated with Saint Denis. White had turned into the colour of royalty. With the white sandwiched between the red and blue, it supposedly symbolized the control of the people over the monarchy. However, others said that it was inspired by the American revolutionaries, and another theory is that the tricolore was inspired by the design of the Dutch flag. The tricolore was first used as a canton in the French navy in 1790. A “canton” refers to a quarter of the flag, likely the top left hand corner, like the stars of the American flag and the Union Jack on various flags in the British Commonwealth. In 1794, the French National Convention named the tricolore the national flag of France, but this act wasn’t met with resounding approval. The navy, for one, resisted using the full flag—they still wanted to sail under the white flag of the monarchy. During the revolution, the national flag was rarely used, and people favoured the red flag of the Jacobin Club instead because it symbolized defiance and national emergency. The tricolore wasn’t used by the army until 1812, which had until that point been using a flag with a white cross on a red and blue field. The use of the tricolore initially was relatively short-lived. 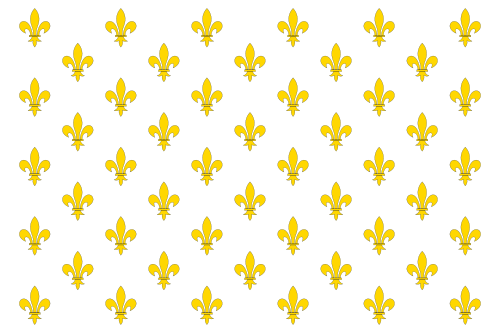 In 1815, Napoleon was overthrown and the Bourbon monarchy was restored, and with it the white and fleurs-de-lis flag. Fifteen years later, in 1830, the July Revolution took place. It saw the placement of the “citizen king” Louis-Phillipe on the throne. Louis-Phillipe was a distant cousin of the Bourbon king and had agreed to rule as a constitutional monarch (though he, too, would one day be overthrown). He agreed to restore the tricolore as the national flag of France, and it has been in use ever since. “Oriflamme” now refers to a “banner with pointed ends” in French. The Dutch flag, with three horizontal stripes, is considered the first tricolour. In addition to the canton, other parts of the flag include the “hoist” or the half closest to the flagpole, and the “fly” or the half furthest from the pole. The use of the French flag is a lot steadier than the French monarchy. The “citizen king” was overthrown in 1848 following yet another revolution. He was the last king of France, though Napoleon III is considered to be the last monarch. In a sad twist of events, Louis-Philipe’s father was beheaded during the Reign of Terror despite supporting the Revolution of 1789. Many French colonies during the colonialism period used a full tricolore with an additional symbol, or placed the tricolore in the canton on their flags. Today, the flag of Quebec—a French-Canadian province—more closely resembles a pre-revolutionary flag than the tricolore, with a blue background, four white fleurs-de-lis, and a white cross. Love the site. Thank you for doing this. One thing about the French flag—the stripes aren’t equal in width. In order to appear equal, the proportions are 30% blue, 33% white and 37% red. The history about the French flag in this article is not correct. The real history of the French flag is that they stole it from the Dutch. In the 1600’s the French still didn’t have a common flag. In 1667 they started a war with the Netherlands in an allegiance with the English to try and take control of the Netherlands. After the English lost the war with the Dutch at sea and the Dutch deliberately broke their dykes to ensure new French troops could not march up from land the French had to retreat. Some of the troops did manage to steal a Dutch flag during their stay. The Dutch flag is the oldest tricolour flag with horizontal stripes from top to bottom red, white and blue. By the time the retreating French troops arrived back from the Netherlands to France they were soo tired that they could not hold the flag-pole up right anymore, but instead held the flagpole horizontal resting on their shoulders. This made the original Dutch horizontal tri-colour look like the current French vertical tri-coulour. This article helps me alot while I’m doing my Social Science assignment about the European countries who came to the Pacific.